Fourteen years after John Speke arrived in search of the source of the Nile--and a year after Henry Morton Stanley's visit--the Church Missionary Society arrived in Kampala. It was 1876. The kabaka allotted the missionaries Namirembe Hill, a mile from his own palace. Albert Cook, the medical missionary had not yet arrived, but in his memoirs he has a photo of the first church built on the site. It looks like a giant squared-off haystack, about 80 feet on a side. Cook writes that it was "blown down" in 1894. A brick replacement was built in 1901, but it had a thatch roof and burned in 1910. 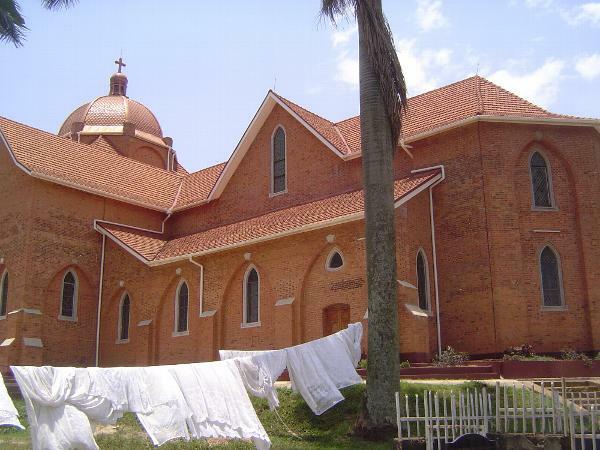 The result was this, the third Namirembe church, a cathedral consecrated in 1919. Mirams, the planner, noted in 1930 that "it is unfortunate that a good close up of this building cannot be obtained since it occupies all of the summit of a steep hill" (p. 12). That's still the case, though you can find good air photos.